If you are curious about moissanite, chances are good you are shopping for an engagement ring, or you also have an interest in diamonds. Perhaps you have seen moissanite engagement rings for sale as a cheaper alternative to traditional diamond rings, and you are wondering if the lower price is worth it. Or maybe you saw a moissanite detector for sale and wondered what its application was. 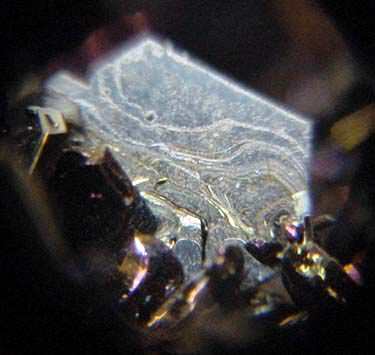 A moissanite crystal at 14x magnification. On a chemical level, moissanite is silicon carbide, with the formula SiC. In nature, it is quite rare. It can be synthesized in laboratories, however, which makes it widely available at a reasonable price. Its name is derived from that of the French chemist who discovered it in 1893, Henri Moissan. The crystal structure of moissanite is very similar to that of a diamond, with the same type of strong covalent bonds. This makes moissanite quite strong and able to stand up to serious pressure. 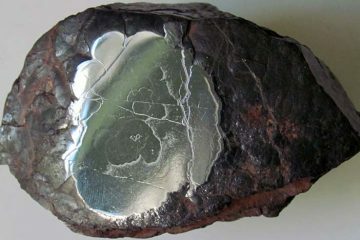 In appearance, it is also very similar to diamond, and with the naked eye, it can be quite hard to tell the difference. Like diamond, moissanite colors can range, and are graded on the same scale. As with diamond, colorless moissanite is typically the most prized. Like diamond, moissanite can be cut and polished so that it will exhibit a beautiful, bright sparkle. Because it is typically created in a lab, it may actually appear superior to a real diamond. One of the best ways to get a feel for moissanite is to compare and contrast it with diamond. 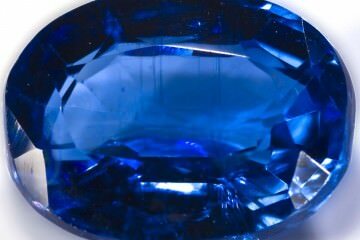 This discussion will also help you when you are shopping both to decide which type of gemstone to purchase, and to properly identify what you are buying. Durability: Diamonds are the hardest known naturally ccurring minerals on the planet, and rate a 10 on the Mohs scale of hardness. Sapphires for comparison score a 9. What about moissanite? A solid 9.25. Brilliance: Both diamond and moissanite exhibit a beautiful sparkle, but the nature of the sparkle differs, and herein lies one of the easiest ways to tell moissanite from diamond. The light from the facets of a diamond will generally be colorless (or the same color as the diamond). The light that sparkles from the facets of moissanite will emit a rainbow of hues. Some people love this effect, while others hate it. Either way, it is a great way to identify moissanite from diamond. Color: While both diamonds and moissanite stones are rated on the same color scale, there is no such thing as a truly colorless moissanite. Even the most “colorless” moissanite will usually be slightly yellow or gray under the right lighting conditions. A diamond rated as moissanite on the other hand really is colorless. Usually it is easiest to spot this distinction with larger stones. 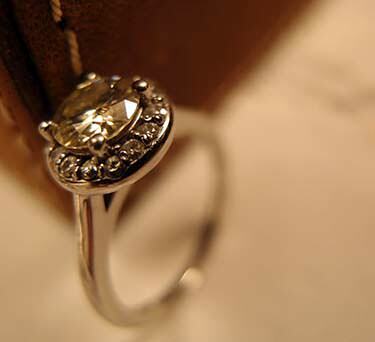 Very small moissanite gems can conceal the yellow or gray quite effectively. Cost: Diamond is far more expensive than moissanite. Since moissanite can be created in a lab with relative ease, it is generally much cheaper. Occasionally fraudulent sellers try to pass off moissanite as real diamond with a higher price tag, or they may offer a dubious discount on a “diamond” which is actually moissanite. This is why there is such a thing as a moissanite detector. People who buy a lot of diamonds can carry a moissanite detector with them and have a reasonably reliable gauge that tells them which type of stone they are purchasing. This is much easier and more effective than trying to gauge the difference by eye every time. It is briefly worth mentioning that diamonds can also be created in labs these days. If you like the idea of saving money on an engagement ring, but you really want diamond and not moissanite, a lab-created diamond is a great third alternative. Lab-created diamonds generally are about 30% less expensive and offer the exact same properties as natural diamonds—plus the appeal to tradition. The most obvious use of moissanite is as a cheaper alternative to diamond. Since moissanite is actually more flawless than diamond and may be even more appealing purely from an aesthetic point of view, it is a great option, especially for buyers who want to save money. Moissanite’s similar to diamond goes beyond the gemstone’s appearance. As mentioned previously, it is one of the hardest natural or synthetic substances. As a result, it can actually be used in similar industrial applications as well. Like diamond, it can be used in high-pressure experiments, and it can also be used in thermal and electronic applications because of its conductivity. Shopping for moissanite calls for a high degree of awareness. Basically, you want to be sure you know what you are getting. If you wanted a diamond, you would hate to buy a moissanite on mistake, thinking you were scooping up a great deal. The converse can happen too, though. You could be deliberately purchasing moissanite, but you could be ripped off with a higher price if you make the mistake of thinking diamonds and moissanite stones are similarly priced. Just how big is the price differential between moissanite and diamond? According to Calla Gold, a one-carat diamond could run you around $5,000, while a similarly sized moissanite might cost you only around $700. In other words, diamond costs more than seven times as much as moissanite! Calla Gold also notes that diamonds and moissanite stones are usually measured differently. While diamonds are generally measured by their weight in carats, moissanite is generally measured in millimeters (the size, not the weight). The two gems have different masses. A one-carat diamond is roughly the same size as a 6.5mm moissanite. How many mm does a one carat diamond measure? According to this chart, it is actually only slightly smaller. Note that value is also measured subjectively and qualitatively. Let’s say you are thinking of buying your girlfriend a moissanite engagement ring. Depending on her personality, she may or may not value the ring sentimentally as much as she would if it were diamond. She might consider you cheap for not buying her a “real” engagement ring like her friends have, or she might value it just as much as a diamond because she sees its beauty as well as its practicality. A moissanite can make a great option for a diamond engagement ring, but run it by your partner first. Because moissanite looks so similar to diamond and has many of the same characteristics, it can be cut into the same dazzling shapes and set in the same types of jewelry. You can find moissanite pendants, necklaces, rings, earrings, bracelets, and more. The sky is the limit when you are shopping for moissanite jewelry. Whatever you are looking for, you should have an ample selection, and at a lower price than you would pay for diamond. As you might imagine, moissanite engagement rings are very popular, but they have yet to replace the diamond standard, and it seems unlikely that they ever will. If they do, it will not be for a very long time. Part of the allure of diamond is its expense. While moissanite may suit many more budgets than diamond, many women feel cheapened if their partners spend less money on them. Still, this is not the case with everyone, and some women will love moissanite. Moissanite, like diamond, is very hard, which means it is a durable choice for jewelry that will be worn every day. Part of the sentimental appeal of a diamond is that it is “unbreakable,” and symbolizes an unbreakable bond of love. While neither diamond nor moissanite literally are unbreakable, they are both very hard substances, so this sentimental appeal still stands with moissanite. Moissanite costs substantially less than diamond. This not only means you can save money for your wedding or honeymoon, but also that you could afford a larger or more brilliant gemstone for the same price that you would pay for an inferior diamond. With moissanite you have no need to worry about the history of the gem you are buying. With diamond, you need to be concerned with “blood diamonds,” or “conflict diamonds,” which were mined in war-torn African nations and used to finance violence. Moissanite displays a rainbow of colors in its sparkling facets. Some people consider this an aesthetic plus. Some people do not like that rainbow effect and consider it more of a disco ball effect. For these people, diamond’s colorless sparkle is preferable. Because moissanite has a lesser value, it may not make as impressive an heirloom to pass down to your children. Many moissanite gems have a yellowish or greenish cast which you can see under certain types of lighting, even if they are graded as colorless. A moissanite is non-traditional. Diamond carries that timeless appeal. For a lot of people, buying a diamond ring is just what you do. Your partner may feel cheapened by your decision to purchase moissanite instead of diamond. She may see it as a reflection of her own value being “lesser,” like the value of the ring. If you do decide to buy moissanite jewelry, especially a moissanite engagement ring, there are some steps you can take to ensure you are getting the highest quality product and that it will be well-received by your partner. Tell your partner straight-up what you are doing. Ask her openly if she is okay with you shopping for moissanite and not diamond. Pay close attention not just to the answer she gives, but the way she says it. A grudging “yes” is not a real “yes.” If she really does seem genuinely fine with it, you are good to go. Ask to see the moissanite you are thinking of buying side-by-side with a diamond with the same color rating. Observe the color difference carefully to be sure that you can live with it. Ask to see the moissanite and the diamond under regular light, not just sparkly jewelry store light. Go with a round cut if in doubt; this one will minimize the off-tint appearance and keep your moissanite looking as colorless as possible. The emerald cut is one to avoid. Staying under two carats will also help to minimize the yellowish or greenish hue. Play close attention to dubious pricing and make sure to shop from a reputable vendor. You do not want to pay a diamond price for moissanite. Also keep in mind that just as untrustworthy jewelers often try to pass off moissanite as diamond, they may also try to pass off other simulants as moissanite, such as cubic zirconia or quartz. Be very leery of deals which are too good to be true. Cleaning moissanite is something you will want to do regularly to maintain the sparkle and shine of the jewelry. Moissanite does not actually seem to attract as much grease and oil (or at least, it does not adhere as much) as diamond, which is a plus, so it does not require as many cleanings each year. Still, now and again you will want to take care of it. An ultrasonic cleaner works fine. You can use a steam cleaner if you want, though it is not advisable. You can also clean it by hand using a mild detergent (stay away from abrasives or soapy detergents that will leave a film). Use a soft-bristled toothbrush to scrub your jewelry clean. Always be gentle when cleaning jewelry! Storing moissanite is a simple matter. Moissanite is a tough substance (in fact, it is tougher than diamond, even though diamond is slightly harder), so you do not need to be too paranoid about it. Store it in a jewelry box with a soft lining when you are not wearing it. Keep it in its own compartment, especially if the piece has a soft gold setting you don’t want scratched. Moissanite is fine to wear every day (in fact, because of its added toughness, one could make the argument it is actually more wearable than diamond), but take it off before doing manual labor, going swimming, participating in sports, etc. This is always a smart move just to be safe. Intriguingly enough, moissanite was originally discovered from a source of extraterrestrial origin. Henri Moissan was checking out a crater from a meteor strike in Canyon Diablo, Arizona. He believed the stones he had found were diamonds, but upon closer examination, he discovered they were in fact silicon carbide. For a very long time, the only moissanite deposits found were discovered in other meteorites. 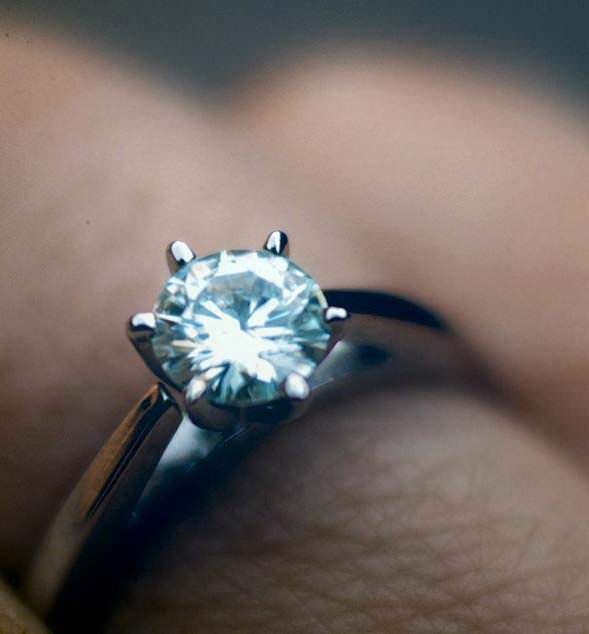 Then, in 1958, moissanite was found in the Green River Formation in Wyoming. A year later, in 1959 in Yakutia, moissanite deposits were discovered in kimberlite in a local diamond mine. For a long time, scientists remained unclear as to whether moissanite forms naturally on earth. 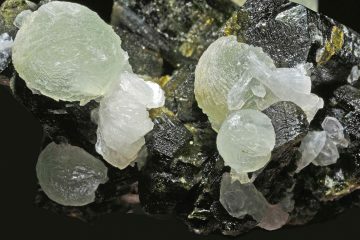 It is now known that it does naturally occur in inclusion form in a variety of different substances, including kimberlite, lamproite, ultramafic, xenoliths, and diamonds. In nature, moissanite remains quite rare. It was Jöns Jacob Berzelius who discovered how to synthesize it in a lab (he remains better known for his discovery of silicon). Moissanite jewelry first appeared on the market in 1998. Since then, it has become quite popular as an alternative to diamond both because it is less expensive and because frees buyers from concerns about exploitative mining procedures (“blood diamonds”). Of course, concerns about dishonest marketing have also surfaced, which is why moissanite detectors are now widely available. It’s hard to say what moissanite means, because it depends largely on a given person’s attitude towards it. For those who think moissanite makes a suitable replacement for diamond, the meaning of moissanite is largely what they would associate with diamond. Moissanite symbolizes unbreakable romantic love. Those who are not fans of moissanite however have the opposite associations with it. They may associate moissanite with cheapness or shortcuts. They make feel as if it does not mean much at all. Finally, metaphysical practitioners associate unique meanings with moissanite not directly connected to diamond. To them, the stone is one for reconnecting with youthful innocence and childhood dreams. The sparkle of rainbow colors in the facets links the stone to all the chakras, making it a great purifier. Diamond: The hardest known natural mineral substance on earth. Diamonds are the traditional (and expensive) choice for engagement rings. Cubic zirconia: Another synthesized alternative to diamond. Unlike moissanite, cubic zirconia gems tend to get dull over time and lose their luster. Cubic zirconia is also softer and less tough. It scratches and breaks much more easily. It is cheap, but it is a poor substitute for diamond or moissanite! Quartz: Quartz is one of the most common mineral substances on the planet. It’s very inexpensive as a result. 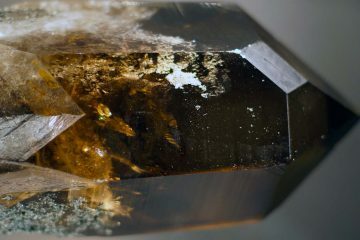 You may occasionally run across cut and polished colorless quartz as a substitute for diamond. Sometimes quartz is falsely marked as moissanite and sold at the same price. Watch out for that trick! Glass: Glass is also sometimes used as a cheap substitute for diamond or moissanite. This is another one to avoid. Now you have read up on moissanite and how it compares with diamond, cubic zirconia, quartz, and glass. You know the pros and cons of moissanite jewelry, especially when it comes to shopping for an engagement ring, and should be ready to head to the jewelry store knowing exactly what you want! I found a glass rock after pushing back 200 aces of old trees and mud. It’s a vary secluded place on people around and no roads! The rock is a light pink or a light orange! It very slippery so slippery that it’s odd. I can’t seem to find anything on line about it. All most like no one has seen one. Can someone help find out what it is!